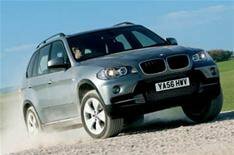 BMW's diesel initiatives | What Car? While the 1 Series convertible and X6 grabbed the attention, BMW also launched its first two new diesel models in the American market, the X5 3.0sd and the 335d. Both feature a 262bhp 3.0-litre diesel engine that meets stringent emissions standards, and will be available from midway through this year. The significance? Some will consider it a good thing, others a sign of just how far behind Europe the USA is, but it's clear that the message of fuel efficiency and lower emissions is finally being given a kick-start across the Atlantic.